A couple of years ago our clients bought a very private and secluded property at the edge of the Morton National Park, Kangaroo Valley. Besides extensive bushland, the property consists of a beautiful plateau and lawn with a large escarpment to the north and uninterrupted views over the tree tops into the National Park to the south. An old metal shed had been placed on the plateau and over the years been transformed by the previous owner into a dwelling. The task for our office given by the client was to redevelop the site, demolish the existing house and build a single storey dwelling within the constraints of the property being categorized as Flame Zone. The client asked for a weekend retreat, with the long term plan to relocate their main residence from Sydney down to the Kangaroo Valley. 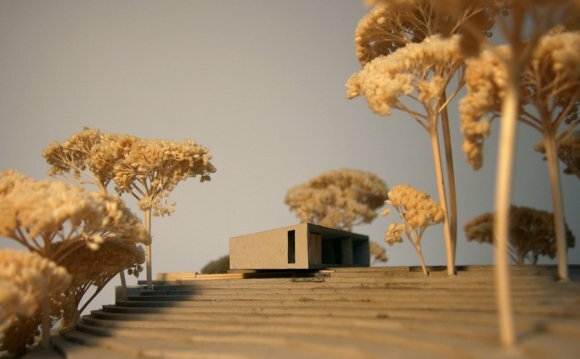 The new house is placed carefully into the surrounding landscape. It is designed as a long and simple box, extending in east- west direction. 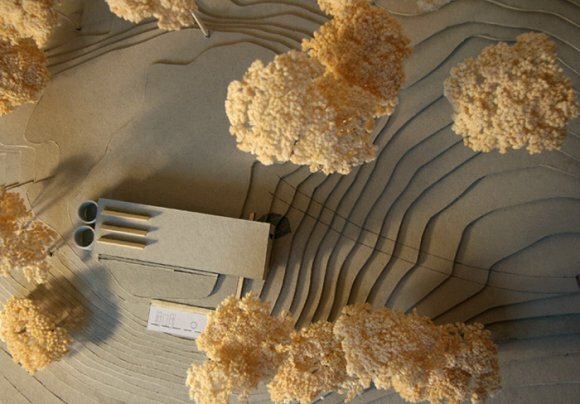 The box is positioned on top of the sloping site and existing lawn as a continuous element, cantilevering to the east and resting on an existing rock formation. The box is open to the north and the south to maximize the views into the surrounding landscape and to allow for cross ventilation. The full frontage glazing is set back on both sides, creating a large overhang and veranda to the north and south. The roof is raked to the north to allow as much sun into the rooms during the winter time as well as sheltering the spaces from the summer sun. The blade walls of the box on either side provide shelter from the prevailing western winds in winter and confine the outdoor space while framing the views in the northern and southern direction. The house is articulated in two parts following the functions within. The main volume contains the large living- kitchen- dining room in the centre and the master bedroom, bathroom, walk in closet, laundry and study attached to it. The secondary volume to the western side accommodates three guest bedrooms and a bathroom. 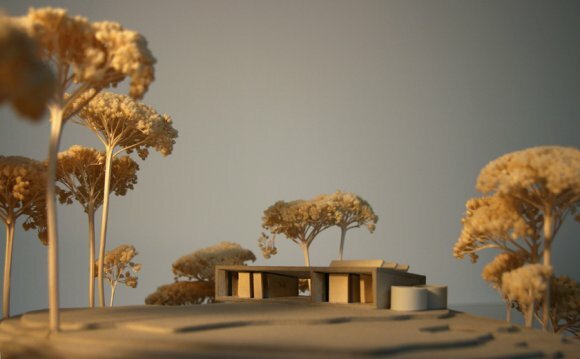 With the north and the south facade being nearly totally glazed, all rooms take most advantage of the views into the large gum trees and onto the escarpment to the north as well as the views to the south into the National Park. The large open plan living- kitchen- dining room extends the full width of the house, allowing for simultaneous views in north and south direction and a connection with the surrounding landscape and nature. The new house is going to be clad in dark metal with natural timber windows. The internal and external floors are going to be tiled in local blue stone, contrasting with the natural timber interiors and white plasterboard walls and ceilings. 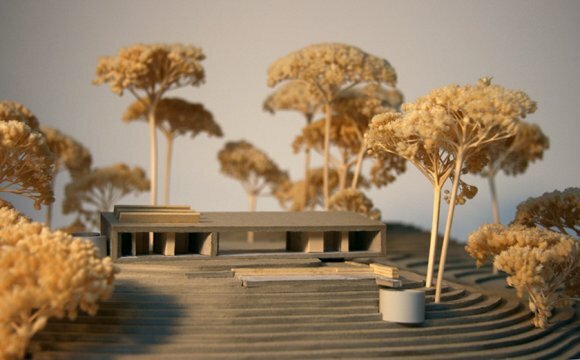 The large terrace to the south of the house is embedded in the slightly sloping landscape, overlooking the tree tops and offering views into the National Park. 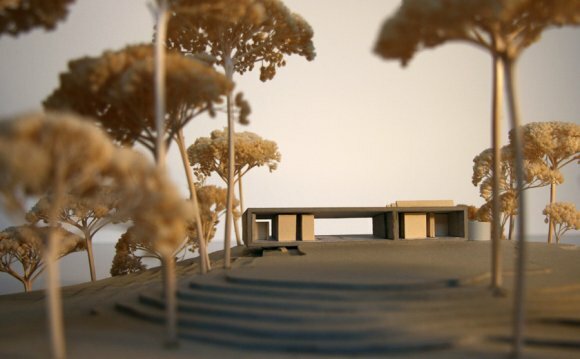 A circular plunge pool is going to be set in between the trees. It has been a very challenging process to obtain Planning Permission considering the Flame Zone requirements and compliance with the relevant Australian Standards. As this mile stone has been achieved, we have been commissioned by the client to start with the Detail Development and obtaining the Construction Certificate. The first conversations for this process have been very successful and we are looking forward to the start of the construction in autumn 2017.